Most of us have a lack of imagination when it comes to how we use our homes, and this extends into the world of RVs as well. We tend to accept the storage we’re given, and outside of purchasing shelving or containers, we don’t get very creative when it comes to where to put our things. 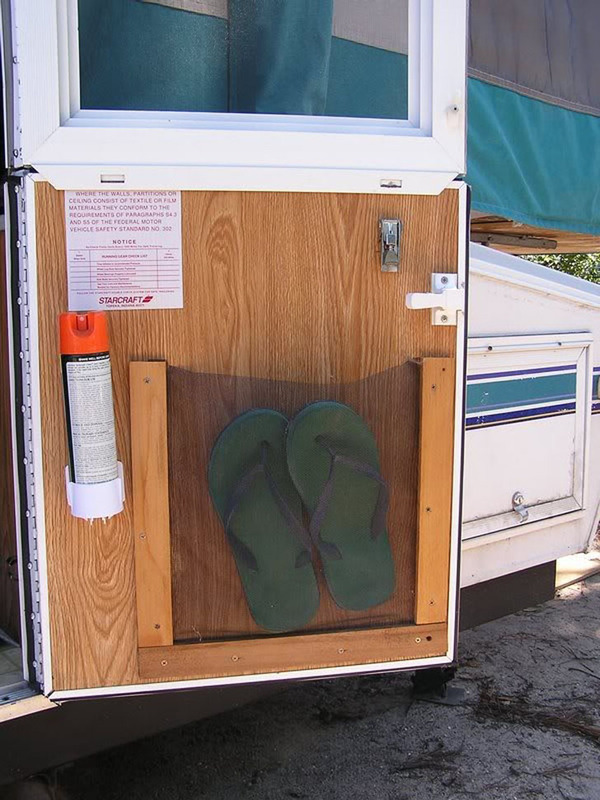 In an RV, this can lead to over-crowded drawers and important gear that cannot be found until after an alternative has already been used. Here are four under-utilized areas that can make great storage when coupled with the right hardware! 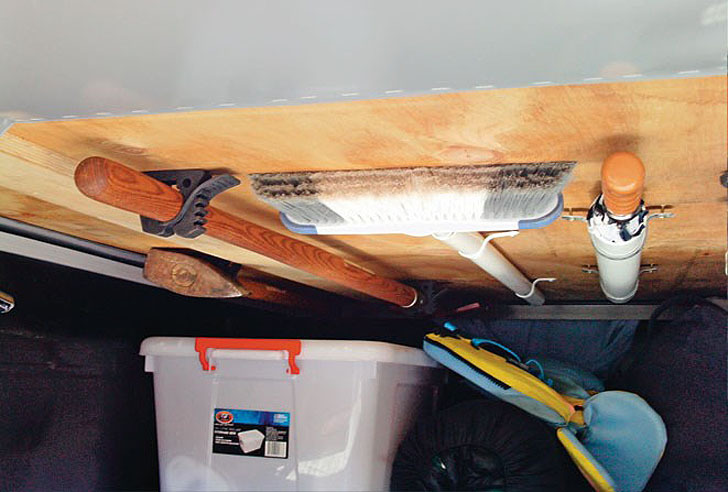 Wall space for hanging items is always at a premium inside an RV, but there are likely multiple areas that represent several square feet each on the back of every room door and cabinet door inside your motorhome or travel trailer. Whether you choose a pocket caddy for your shower goodies on the bathroom door or Command adhesive hooks from 3M for utensils inside the kitchen cupboard, there are a variety of tools at your disposal. 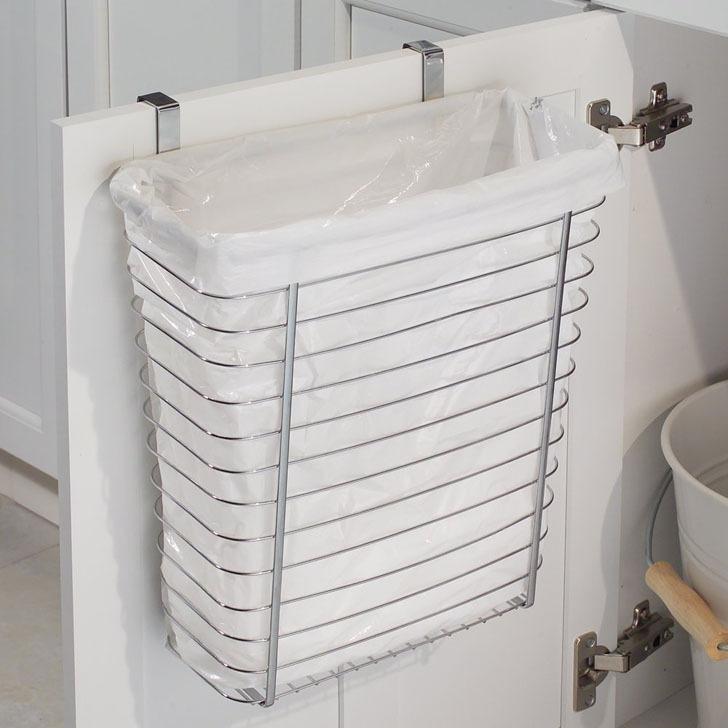 One really cool idea I like is a trash can that mounts to the inside of your under-sink cupboard! 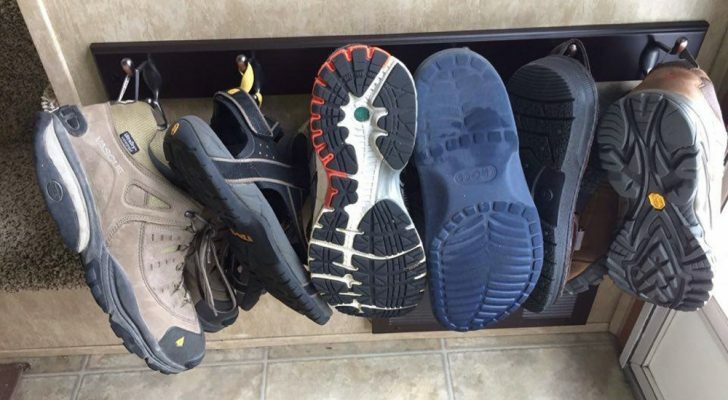 Homemade door storage for bug spray and flip-flops. You might also make your own inside-the-door storage area from some wooden furring strips and bug mesh. Maybe you have some spare trim laying around the garage or in the basement? Cut it to length and screw a few pieces into the wood on the back of the door. Then take some mesh and tack it underneath to form a handy and sturdy storage pocket. 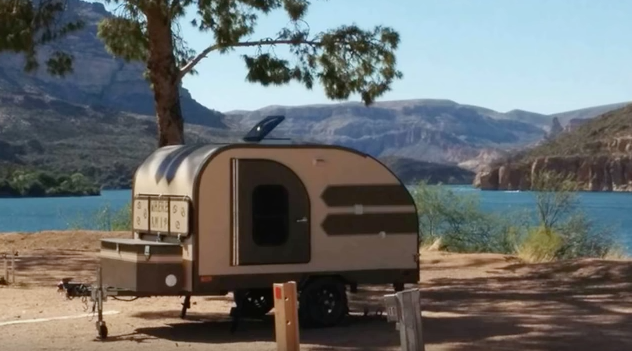 Depending on how your RV is constructed, you can use screw in or adhesive hangers to mount items up and out of the way, but still close enough to get to when needed. The ceiling of a utility space is great for hanging brooms, mops, and other long items such as fishing poles. Over-the-sink hanging baskets can provide great travel-safe storage for produce or other small kitchen items. In the bathroom, hanging shelves or baskets can organize soap, shampoo, and loofahs. 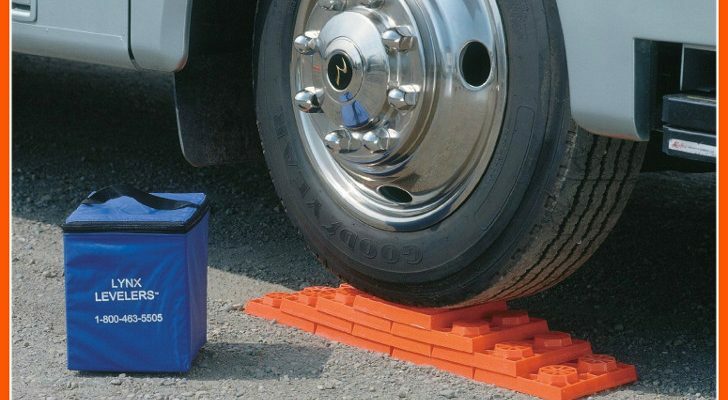 If you think of what you use in each space of your RV, ideas will come. Long tools mounted to the ceiling of an underfloor storage space. 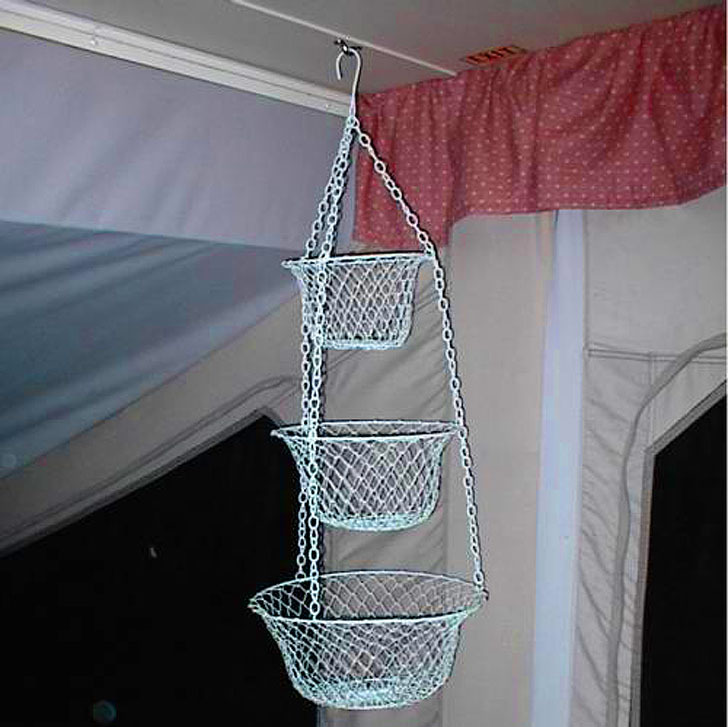 Baskets hung from a small ceiling hook. 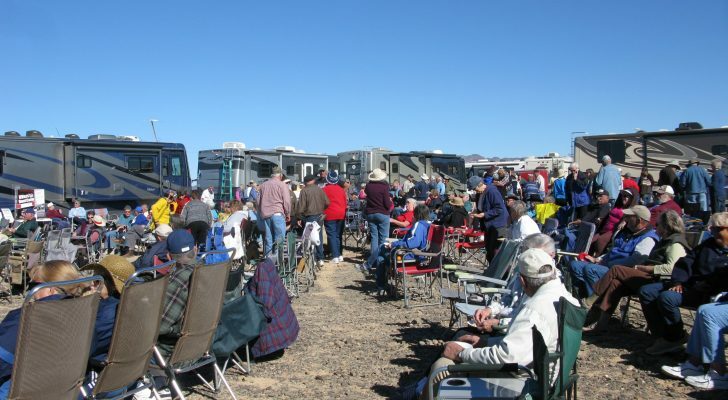 Inside the walls of your RV, there are pockets of unused space. One such location is inside dinette benches. While many allow for drop-in storage from the top, adding full extension guides and drawer boxes can make this space more usable since it doesn’t require dismantling your dining area to access it! Small slide-out and drawer units can also be found for under your tabletops and cabinets to add small spaces for important items that otherwise just get jumbled in with everything else. Under table drawer for small items. This pull-out table uses a similar idea. 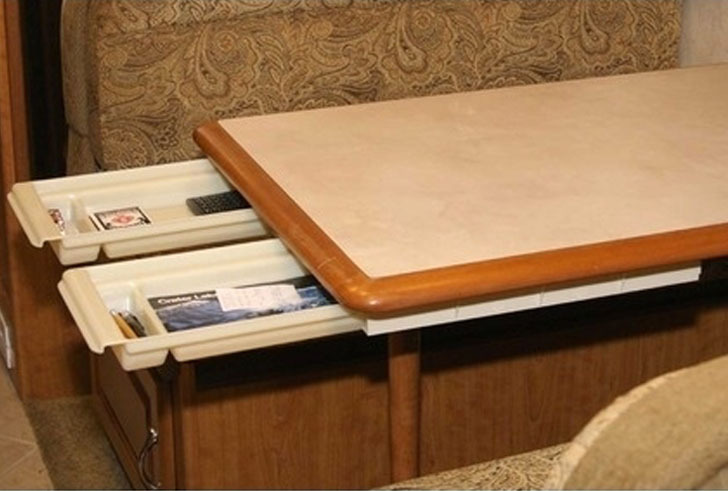 Many RVs do make use of this space (at least partially) with hidden drawers. 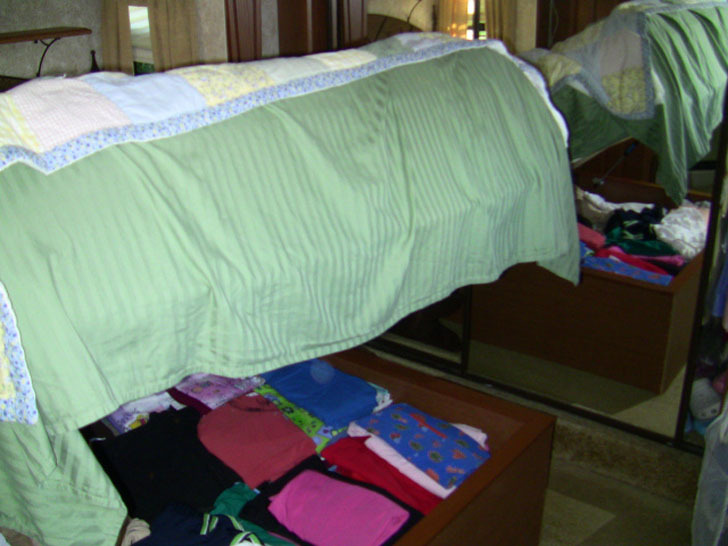 In many cases, however, the center part of the space under the mattress is completely unusable. 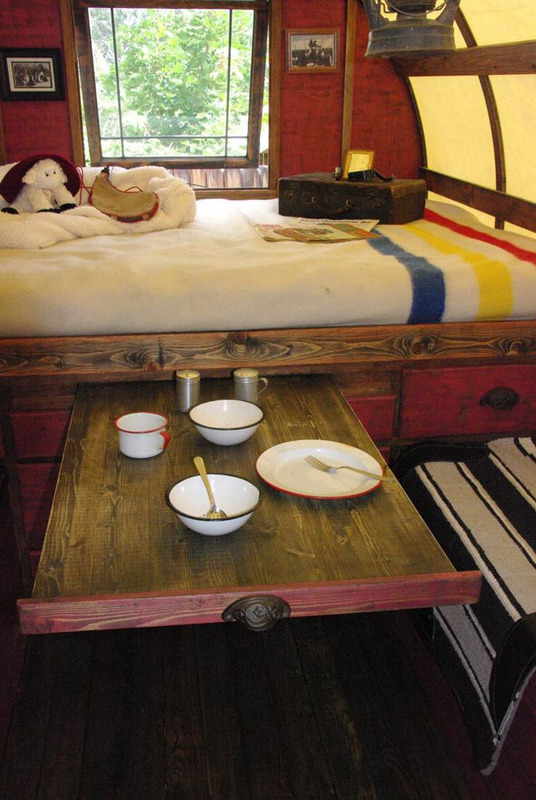 Whether you add drawers, or a hinged platform to lift the mattress up and out of the way, this is a great place for items that stay stored until used and are not typically packed away until it’s time to break camp. 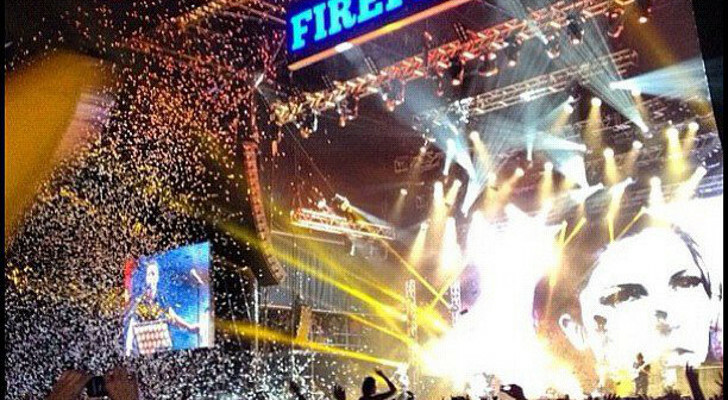 Things like outdoor furniture, tents or canopies come to mind. 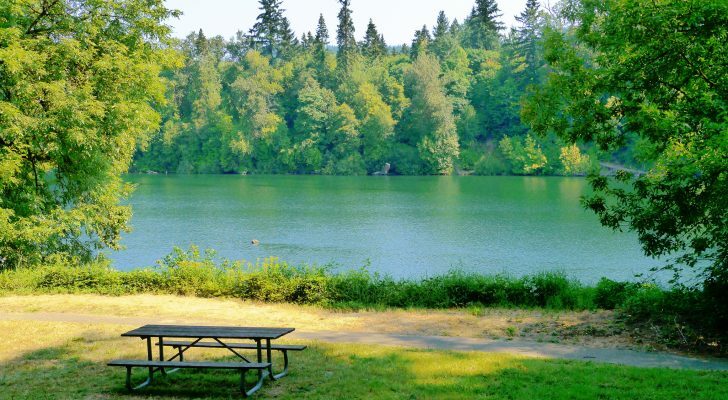 If you live in your RV, this is also a great place for seasonal item storage. Don’t forget under the steps to your bedroom I made as storage for files and any office items I need and more.